One of the most important parameters in the development of therapeutic biologics is their long-term stability. While after purification being seemingly stable in a variety of formulations, many antibodies display very slow aggregation kinetics over time. This gradual aggregation could thus far only be evaluated by monitoring monomer contents and aggregates over months or even years. Predictive methods are therefore urgently needed to speed up the development of biologics. 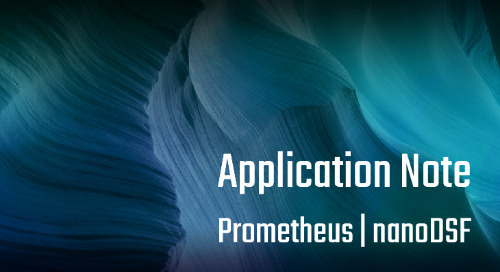 Here we demonstrate that the Prometheus NT.Plex by NanoTemper Technologies can be used for predicting long-term stability in only a few hours. The approach uses a combination of thermal and chemical unfolding analysis in a high-throughput setting. We show that chemical denaturation is a tool which can determine folding enthalpies of monoclonal antibodies (mAbs) to predict their long-term stability in formulation screenings. Using the Prometheus NT.Plex nanoDSF instrument with aggregation detection optics, we screened 5 formulations at different mAb concentrations for their thermal and chemical stability. The obtained unfolding data correlates with long-term turbidity and monomer content over time, showing that the Prometheus NT.Plex can be used to rapidly predict the long-term stability of biologics within 1 day.